The demand for justice in the killing of Marcus-David Peters moved from the streets to the council meeting room Monday night. 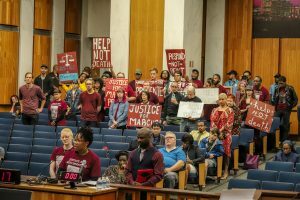 After a march for justice and reformation for Peters on June 2, family and community members addressed city council to call for transparency and an examination into Richmond Police Department’s crisis intervention training during the citizen comment period of the meeting. 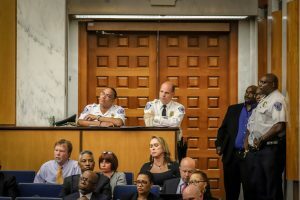 As the demonstrators sat in the back of the gallery wearing burgundy and demanding justice for the actions by the department, Richmond City Council recognized Deputy Police Chief Steven R. Drew for his service to the community. Drew has no direct connection to the investigation, but offered a stark juxtaposition to Peters’ sister, Princess Blanding, who took to the podium a short time later. Blanding, in her address, focused on the need for better crisis intervention training and response, asking the RPD to release the curriculum for the training so it could be assessed for its effectiveness. Throughout her address, she also insisted that the current communication by the department did not demonstrate transparency. 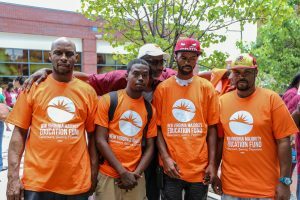 “If what you have done so far is what you call being transparent, the community and I will pass on what you have to offer because there are still so many unanswered questions,” Blanding said. After the community comment, Blanding spoke with RVA Mag and said she was hopeful that city council was receptive to her and others comments. 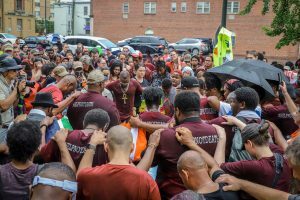 “I’m going to be very optimistic and hope they are being very receptive and they plan on joining with us in this movement to continue to fight for justice and reformation,” Blanding said. Lynetta Thompson, a former president of the Richmond NAACP, also spoke, asking the police department for more transparency. 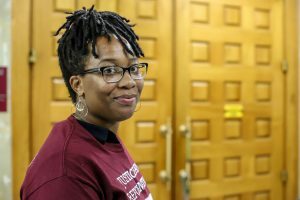 Rebecca Keel, a conflict resolution specialist, has been outspoken in calling for an end to the murdering and dehumanization of black and brown people. At council she claimed the family is due an official apology. “One must admit harm when harm is done and that is truly how we as a society, and we as a city, begin our healing,” Keel said. Family, friends, and community members had previously gathered on June 2 at the Siegel Center to remember the untimely death of Peters. The hundreds of marchers ended up at police headquarters where they continued their primary chant of, “help not death.” Signs bearing the phrase were held up by many demonstrators in burgundy during the comments at council. 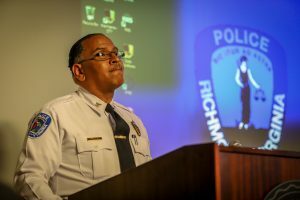 “My disappointment continues at the higher levels, instead of taking responsibility and stating that you all messed up and extending you sincerest condolences to my family, the Richmond Police Department was insincere, insensitive, judgemental, and prepared to defend your officer without releasing information to the public,” Blanding said. 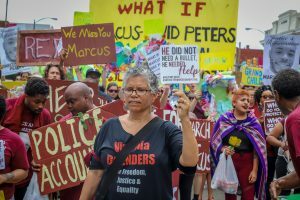 “Help, not death.” That was the chant that permeated today’s march that ended at the Richmond Police Department (RPD) headquarters, where hundreds of people demanded justice and reformation for Marcus Peters – an unarmed black man in mental distress who was shot and killed by a Richmond police officer on May 14. 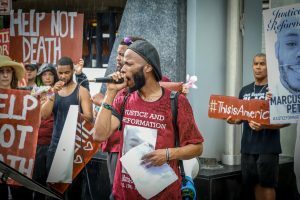 “We are here in honor of Marcus-David Peters and other folks who have fallen victim and died at the hands of state-sanctioned violence,” said Jasmine Leeward, a New Virginia Majority representative who was one of the march organizers. 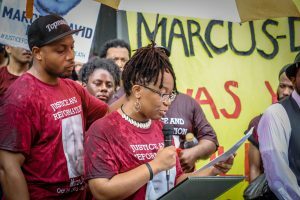 “We are trying to band together as a community to show that Marcus’ life mattered, and other victims of state-sanctioned violence, their lives mattered, and to call for justice, accountability, and reformation.” She also acknowledged that there needs to be more clarity and compassion and “less violence” when it comes to people who are in a mental health crisis. Throughout the march, there was a constant, but impassioned reprise from those who attended: That Peters needed “help, not death”. On the day that Peters was killed, he was having an unidentified episode of mental distress – something which is far too common in the US – especially as police come into contact with people who are having these episodes. According to Chief Alfred Durham in a press conference last week, officers only receive 40 hours of training on how to handle issues surrounding mental health. Nonetheless, Peters was the 425th person to be fatally shot by a law enforcement officer this year, according to The Washington Post’s Fatal Force database. 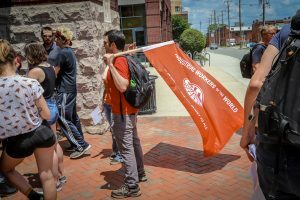 The march began at VCU’s Siegel Center at 1 pm, before departing on the mile-long trek to the RPD headquarters on Grace Street. For the family and friends of Peters, the march retraced the steps which ultimately culminated in a life cut short; beginning at the place where Peters graduated with honors, past the Jefferson where he worked part-time, eventually ending at RPD headquarters. 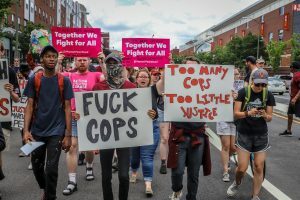 A cabal of different organizations and individuals joined today’s march, including Democratic Socialists of America, Industrial Workers of the World, Iraq veterans, along with members of various black churches, people committed to social justice, and those who simply thought the death of Peters was an abuse of police power all rallied to support Peters’ family. Before the march to RPD officially began, speakers including march organizer Rebecca Keel and Pastor of Second Baptist Church, Dr. James Henry Harris took to the podium. 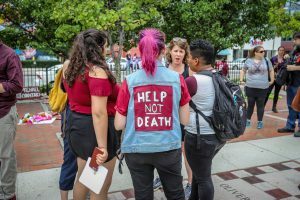 VCU community organizers Khudai Tanveer and Taylor Davis also confronted the silence from the university on the death of Peters with an open letter detailing demands to the university and holding the school accountable for their lack of response on one of their alum. “We are allowing for 18 days from the initial receipt of this letter for the release of the stance critical on the use of force. We are generously selecting 18 days when it only took 18 seconds to make a decision that ultimately ended the life of Marcus-David Peters,” said Tanveer. 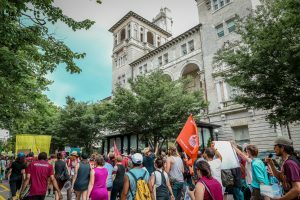 As the march snaked through the city on the way to the RPD, it included an unannounced stop at the Jefferson Hotel where march goers drowned the hotel in chants, shouting, “Shame on you, Jefferson,” in reference to the hotel not reaching out to Peters’ family during the incident. 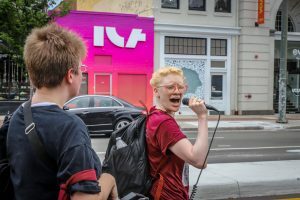 Despite this and the muggy 80-degree heat, the crowd rarely slowed, ignited with an energy and mission that pushed well beyond the simple march, making it clear that this is more than just a political statement. Eventually arriving at RPD headquarters just as it began to rain, more speakers took to the podium right at the front entrance to the main building. 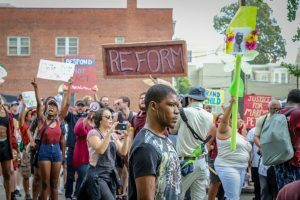 No one from the police made an appearance or spoke to the marchers and Durham’s absence was noted by some of the marchers – some saying that it felt like an admittance of guilt. 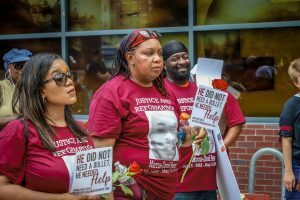 Princess Blanding, the sister of Peters, read six demands, among them a call for RPD to publicly release what their crisis intervention training looks like so it can be thoroughly assessed for effectiveness. She also called for the creation of a “Marcus Alert,” a way for the community to “call on mental health professionals to respond when community members are clearly in crisis,” as opposed to immediately deferring to the police, which can escalate the encounter. On the heels of RPD’s reported excessive force against autistic Chesterfield teen McKhyl Dickerson the week before, reformation is needed now more than ever. The 2017 Police Violence Report shows that while black people are more likely to be unarmed, and less likely to be threatening, they are more likely to be killed by the police. This was a theme in today’s march as the names of black people killed by the police were never far away; names like Michael Brown, Eric Garner, Tamir Rice, Sandra Bland, and now Marcus Peters. 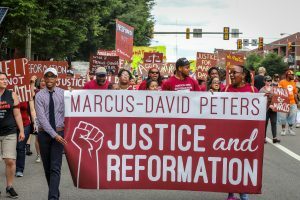 Today’s march for justice and reformation for Marcus Peters was also a response to the systematic and institutionalized mistreatment, violence, and over-incarceration against minorities in the US by police. In 2018, questions over accountability and transparency remain more critical than ever, more so when connected to ongoing challenges in how police deal with those who appear to be having a mental health crisis. Instead of vilifying those that are experiencing such an episode, the city needs to look for better mechanisms to help those in need. This is the only way this city will be able to move forward from this incident. Richmond Police Department (RPD) held a press conference this morning to release footage showing the officer-involved shooting of Marcus Peters on May 14 at 5:33 p.m.
Peters, a VCU graduate and biology teacher at Essex High School in Tappahannock, was shot and killed by RPD Officer Michael Nytantaki – who is currently on paid administrative leave – after crashing his car on the 95/64 highway interchange. Peters, who was naked at the time, was rolling on the ground and dancing in the street before being tased and eventually shot in the abdomen. He died shortly after midnight. The medical examiner has listed the death of Peters as a homicide. The press conference, chaired by Chief Alfred Durham, was an emotional presentation of the circumstances surrounding the death of Peters and included video from the Jefferson Hotel, traffic cameras, along with footage from the officer’s body-worn camera. 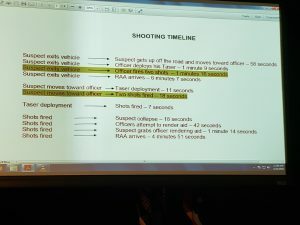 Before the footage was shown, Durham addressed the room by saying there has been a lot of misinformation circulating about the incident, but noting that the press conference was an attempt to maintain transparency – something he said remained one of the highest priorities for the department. As footage played, Durham talked through the scenes depicted, which included video from the Jefferson Hotel, where Peters was a part-time employee. The video showed Peters walking through the hotel without his shirt on before he stops to speak with other employees in a service hallway. He eventually leaves the hotel and gets into his car without any of his clothes, which were later found on Franklin Avenue. The next clips consisted of traffic camera footage of Peters speeding down Main Street before turning on to Belvidere, where he was eventually spotted by Nytantaki, who followed him on to the interstate where the encounter took place. Shortly after, Nytantaki deployed his taser. Yet according to Durham, only one prong made contact with Peters, rendering it ineffective. From here Nytantaki re-draws his service weapon, discharging two shots into Peters’ abdomen before he eventually tumbles to the ground. A state trooper can be seen shortly afterward asking Nytantaki to “holster your weapon for me”, while police officers arriving at the scene attempted to administer first aid to Peters. “You see officers there putting on gloves. Whenever we use our force, we are to render aid,” said Durham, responding to a question about additional officers who appeared to be standing around idly. During the question and answer session, an emotional Durham addressed the mental health aspect of the incident. “I looked at what it would take to become a psychologist, psychiatrist, mental health counselor, five to eight years of training. Our police department gives our officers 40 hours,” he said. RPD’s Force Investigative Team is currently leading the investigation with support from the FBI, which is standard procedure for incidents that involve the deadly use of force. Durham would not comment on any aspects of the investigation, only taking questions about the content shown in the video footage at the press conference. Princess Blanding, the sister of Peters, spoke to the press a short time later, saying, “I am extremely appalled that Chief Durham tried to defend the killing of my brother Marcu Peters. 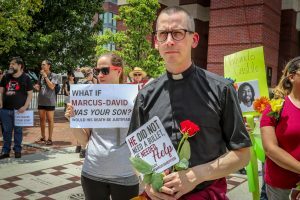 Marcus needed help, not death.” She did not comment on his mental health, only saying that the family had never seen any behavior like that in the video. 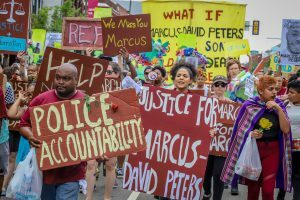 An event called Demanding Justice for Marcus Peters: A Speak-Out & Mobilization has already been planned and will be taking place at Second Baptist Church, West End tomorrow. Peters was the 412th person to be shot and killed by law enforcement in the US this year, according to the Washington Post’s Fatal Force tracker. This incident also follows reporting of excessive force against an autistic teen by the RPD earlier this month.